"Truth tell, anywhere is a life, once there is a love." Your personal history is the history of the world. Just that you don't know it yet. The choices that we make, the thoughts that we think - they all leave an imprint. Moment to moment, we live as if we didn't matter and as if we are the only ones that matter. "There are so many things that we nearly do and they don't matter at all, and then there are so many things we nearly do that would change everything... "
And there's always a moment in time when we know we are right in the middle, between heaven and earth, light and dark, happiness and sadness - perfect equilibrium. It could be anywhere, while vacationing or being at home, watching a waterfall or simply watching the sky, the moment when you forget yourself, when you're completely calm and peaceful, there it is, even if you did not recognize it. In William Blake's words, " To see the world in a grain of sand, and to see heaven in a wild flower, hold infinity in the palm of your hands, and eternity in an hour." "Here is a moment in time, and my choices have been no stranger than millions before me, displaced by wars and conscience, leaving the known for the unknown, hesitating, fearing, then finding themselves already on the journey, footprint and memory each imprinting the trail: what you had, what you lost, what you found, no matter how difficult or impossible, the moment when time became a bridge and you crossed it." Quotes in italics ~ The Stone Gods, Jeanette Winterson. There is an innate quality in a Chinese character, which represents a word rather than a sound or a combination of sounds. 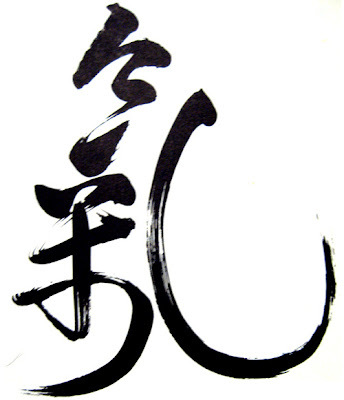 After all, "Shu Fa" (calligraphy) is regarded as the most abstract and sublime form of art in Chinese culture. All calligraphy strokes are permanent and incorrigible; they require careful planning and confident execution, and yet its expression can be extremely creative. And the incidental diffusing of ink blots and dry brush strokes add to the beauty and natural rhythm of the character, revealing its essence and its quality of being. The external is always a manifestation of the internal, and this is quite apparent in calligraphy or painting. The painting is already there before you paint it. Otherwise, you cannot paint. Everything manifests itself in the same way. Perhaps as a punishment for not studying Mandarin hard enough in the growing up years, I am now in awe of the beauty of some of these characters, each capable of being filled with such power and life! 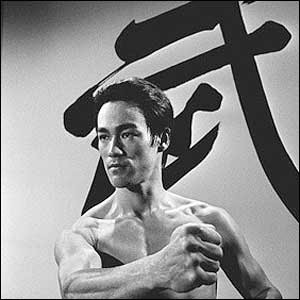 My earliest appreciation (though idealized) of Chinese calligraphy must be of Bruce Lee, poised and ready for action with "Wu" in the background. 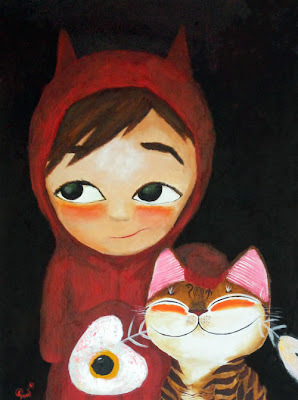 haha This resonated in my mind when I painted "Mao", in an attempt to draw out the innate quality of the cat. “Take things as they are. Punch when you have to punch. The quality of being a cat is just that, its innocent praticality and its seemingly awareness of life without thinking about it. 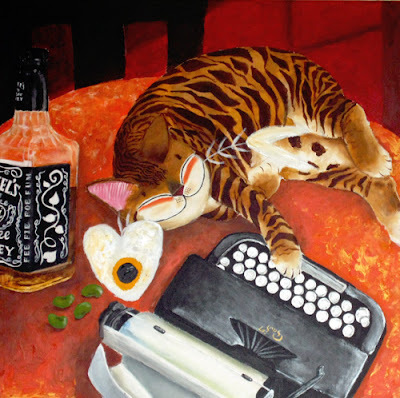 Perhaps our fascination with cats lies in their ability to be themselves based on inner feeling, as distinct from following rules, and hence we cannot "force" a cat to do anything. It's akin to the quality of "de" - moving with the unity of eye and heart (mind). You will always get what you want if you do not want or lack it! If it doesn't matter, it doesn't matter. "You just have to ask yourself what kind of person are you. Are you the type that sees signs? Sees miracles? Or do you think that people just get lucky? Maybe there are no coincidences. At the end of the fairy tale, it is about you and only you. You are your own book and you can fill it with whatever you like - good or bad - it makes no difference to anyone else but you. Never in thought acknowledge an impossibility. When you do, your world shrinks that much smaller! Throw the beans out or plant them. Watch them grow or let them wither. It's always about choice. Myths, stories and imagination, with all its beauty and possibility, contains truth about the world that neither science nor philosophy can access. “Myth is the hidden part of every story, the buried part, the region that is still unexplored because there are as yet no words to enable us to get there. ” - Italo Calvino. “As human beings, our greatness lies not so much in being able to remake the world - that is the myth of the atomic age - as in being able to remake ourselves.” - Mahatma Gandhi. catmasutra- Chill out with Popsicles! 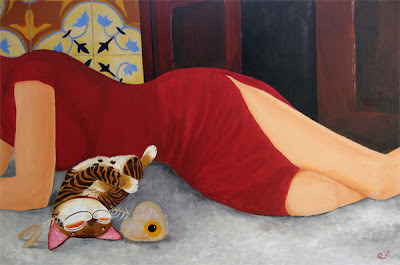 A whimsical piece, "Popsicles" is the largest painting that will be exhibited in Catmasutra 4, this December (13th - 23th) at Utterly Art ! 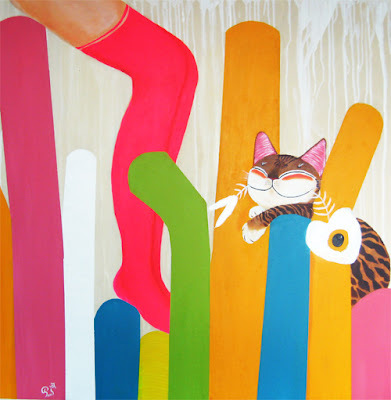 It measures 36" x 36", and features a pair of legs in stockings with the Catmasutra cat balancing as if in perfect unison with the colorful, super flat popsicle-like structures. It brings back memories of seeing children playing in one of those "fish tank" filled with colorful balls in Ikea (which disguises the need for parents to be free of their charges). Seemingly frozen yet warm and cuddly, laced with delicious temptation and playful innocence, this is the ultimate playpen for adults! "Popsicles" is a case of waking up one morning, and wanting to do something big, fun, bright and playful. There is a mood to create a different feel, to test the elasticity between things; wahahaha I ended up combining flat colors with the cat and legs, blur the relationship between them, test gravity, play with temperatures and and put a weird flexibility to the one-dimension pops! I've been wanting to do portraits of people as guest stars, who suddenly find themselves materialized into the catmasutra dreamscape taking on a catmasutra-like appearance, wahahah! There is no distinction between adults and children in this place. 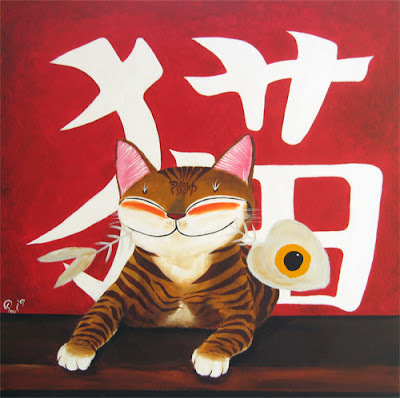 They are simultaneously reduced and enlarged, transformed and affected by the eyes-wide-shut and ear-to-ear grin of the catmasutra cat. It's the externalization of an inner world, of a particular emotion at a particular time. So if you have that photo that captures that singular emotion, you may want to do a catmasutra portrait!